Although November started with CDOA Championships, highly successfully hosted by OBOP, it has since been an essentially quiet month. On the HP front much of it has been taken up with final preparation of the ONZ bid for JWOC2022, and with mapping, planning and general organization for the U23 Development Camp which starts next Saturday. Racing kicked off on Saturday morning with the Middle distance on the imaginatively named Turkish Grinder map – taking the name from the MTB ride with the following description: “Downhill rolling old school track, moderately fast flowing singletrack with some small berms and jumps, and a few roots for added interest. Dense forest canopy makes for a sudden dark entry off the road, but it keeps a lot of the rain off, making this is a good trail to ride when trails are wet elsewhere” which pretty well also described the orienteering experience! Amid the complex MTB track network and the denser vegetation competition in the elite grades was close, Conor Short beating out Gene Beveridge by 22 seconds, and Imogene Scott, after a 3 minute error on #16, having only 3 second margin over Rachel Smith. M21E: 1. Conor Short (WN) 33:34, 2. Gene Beveridge (NW) 33:56, 3. Jonty Oram (AK) 37:47. W21E: 1. Imogene Scott (NW) 41:21, 2. Rachel Smith (BP) 41:24, 3. Sonia Hollands (BP) 48:28. M20: 1. Will Tidswell (HB) 34:31, 2. Liam Stolberger (NW) 38:38, 3. Ronan Lee (HB) 47:47. W20: 1. Georgia Skelton (CM) 33:55, 2. Tegan Knightbridge (NW) 35:44, 3. Jess Sewell (NW) 37:33. In the afternoon proceedings moved to the campus setting of Toi-Ohomai, with an extension into the hilly parkland of Centennial Park to the south. This produced a sprint consisting of two completely different terrains – the highly complex building environment of the campus and the more straightforward but physical parkland. This physicality was largely what made winning times slightly longer than the norm. In M21E Gene took a clear revenge on Conor for the morning result. After the morning close shave Imogene was a clear winner in W21E, while Will Tidswell and Georgia Skelton both completed the double for the day in the 20’s. M21E: 1. Gene Beveridge 19:22, 2. Conor Short 21:16, 3. Devon Beckman (HB) 22:01. W21E: 1. Imogene Scott 20:38, 2. Sonia Hollands 25:38, 3. Angela Simpson (BP) 30:39. M20: 1. Will Tidswell 17:59, 2. Liam Stolberger 19:57, 3. Ronan Lee 21:37. W20: 1. Georgia Skelton 19:16, 2. Tessa Burns (HB) 20:04, 3. Jess Sewell 20:14. 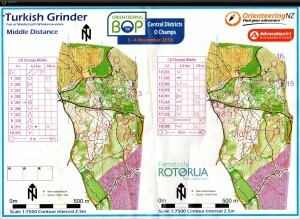 The Long Distance on Sunday was on the new map of Okaraka. Largely open, but also sporting an interesting area of runnable native bush, the area is essentially a 13000 year old lava flow with the contorted topography resulting from pressure ridges within the flow. Oblivious to the geological history Gene And Rachel took out the 21E races on commendably long courses which tested both endurance and navigation. Will was again at the top of M20, but in W20 Kaia Joergensen came to the fore with a massive winning time of nearly 13 minutes. M21E: 1. Gene Beveridge 1:43;05, 2. Scott McDonald (HB) 1:48:59, 3. Darren Ashmore (BP) 1:51:32. W21E: 1. Rachel Smith 1:40:05, 2. Sonia Hollands 1:41:05, 3. Imogene Scott 1:42:29. M20: 1. Will Tidswell 1:20:49, 2. Ronan Lee 1:23:51, 3. Liam Stolberger 1:49:06. W20: 1. Kaia Joergensen (PP) 1:09:40, 2. Georgia Skelton 1:22;16, 3. Tegan Knightbridge 1:27:16. As reported last month the format of races for the final round of the O League at Queen’s Birthday was still undecided. Although the actual areas have still to be finalised the plan for the races on offer has taken shape. The first and third days will be forest races – a long distance on the Saturday and a multi-day distance or middle on the Monday. The plan for the Sunday is for there to be individual sprint in the morning. This will be followed, for elite, 20 and school grades (remember QB is the regional school’s challenge) by an afternoon sprint relay. All other classes will have a second individual sprint. 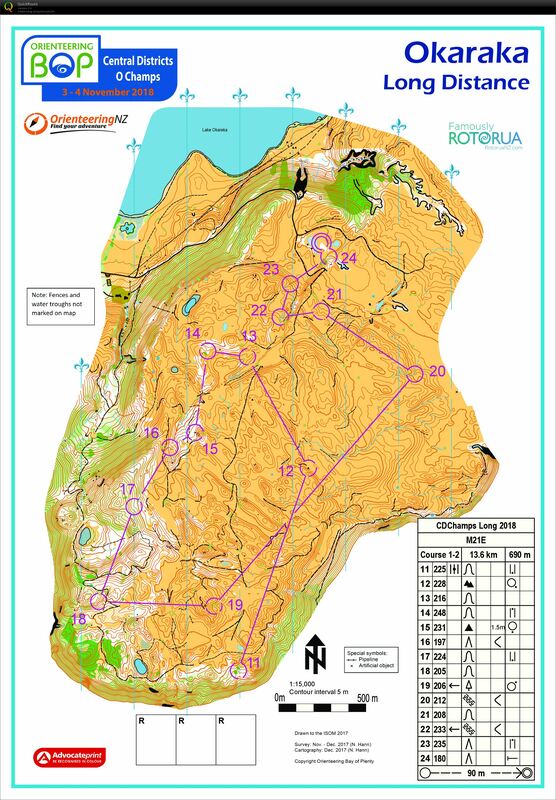 Round 1 25-27 January: South Island Champs (Marlborough) consisting of Sprint, Long, Middle. 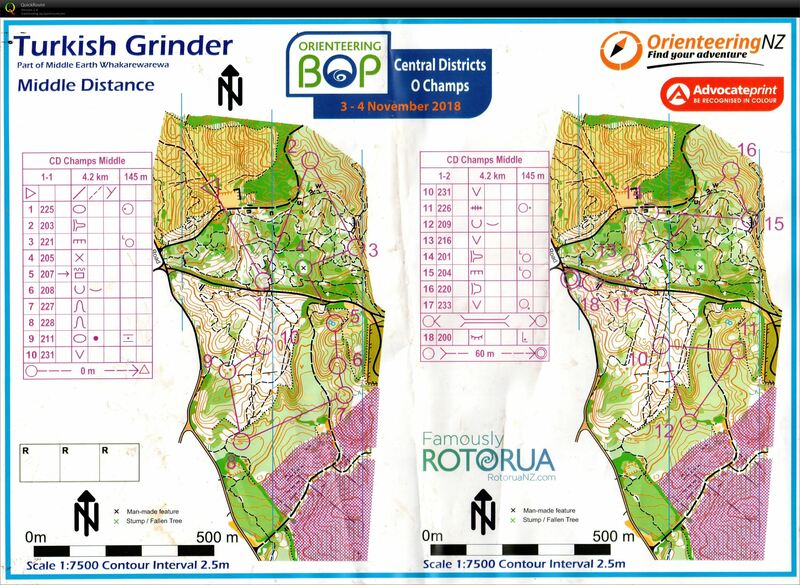 Round 2 30-31 March: JWOC Trials Weekend (Auckland) consisting of Sprint, Long. Round 4 1-3 June: Queen’s Birthday (Manawatu) consisting of Long, Sprint, Sprint Relay and Multi-day distance. With the proposed QB programme there will be 11 individual races spread over the four rounds with the best 7 scores to count. For the individual competitions points awarded will remain as follows (same as the IOF world Cup): 1st place 100 points, 2nd place 80 points, 3rd place 60 points, 4th place 50 points, 5th place 45 points, 6th place 40 points, 7th place 37 points, 8th place 35 points, 9th place 33 points, 10th place 31 points, 11th place 30 points, 12th place 29 points, down to 1 point for 40th place (that we should have such a large field!). The team competition will be based on the ONZ relay, the Sprint relay at QB, and the three best scores from each region in each of the Sprint, Middle and Long distance races in the 21E classes at the ONZ Championships. Thus the team competition will only involve those rounds which traditionally draw the largest fields. Scoring in the relay races will be the same as in the individual races. As noted in the introductory remarks, work has been on-going to develop the formal application by ONZ for JWOC2022. This has involved not only identification of areas (both new ones and older ones that are due to come back into use) but also investigations of the feasibility of providing live tracking, full on-line results and commentary, liaison with potentially relevant local bodies, and thoughts about appropriate course planners and controllers. The decision at the IOF General Assembly to include a sprint relay from 2022 has not only meant a bit of a re-think of areas but, should New Zealand win hosting rights, provides an exciting opportunity to host the first such JWOC race. Once the application is submitted, by the end of December, potential areas have to be embargoed as a precaution, and these will be posted on the ONZ website. What are the chances? The decision to apply for 2022 and not 2021 was partly in recognition that JWOC2020 is in Turkey and a consequent feeling that IOF would want a more central location for 2021. In the event 2021 has now been awarded to Portugal, not perhaps as central in orienteering terms as we might have thought. This may mean applications from the likes of, say, Sweden (last JWOC 2008) or places like France, who have never hosted JWOC. Hopefully the oft-quoted IOF desire to promote orienteering globally may count in favour. Given that this HP news is a little late there is now less than a week before the 2019 U23 Camp gets underway based in Masterton. The programme (below) is now in place and will feature six and a half days of activity. Once again, fitness testing will feature quite early in the programme with this year’s being designed to supplement the sports science testing that over the last couple of months several of the athletes have been undergoing under the supervision of Rachel Hendrie, visiting from Scotland. Rachel will give a talk related to this as one of the evening sessions. 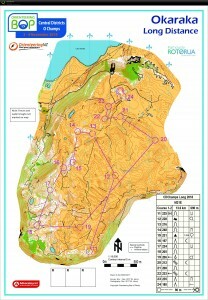 Many of the orienteering sessions will have technique-specific focuses, although there will also be a significant emphasis, in a variety of guises, on actual racing. There will be 34 athletes in attendance (14 female and 20 male) joined by Rachel, Gene Beveridge, Jean Cory-Wright and Malcolm Ingham. It is likely that Lizzie Ingham, who arrives back in the country on the Monday, will also join for the later part of the camp. The full programme for the 2019 IOF World Cup is now available and reads as follows. The absence of Long distance other than at WOC, and a chasing start long in Finland, is perhaps a reflection of the fact that 2020 sees the first sprint WOC. WOC2019 Accommodation – ready and waiting! 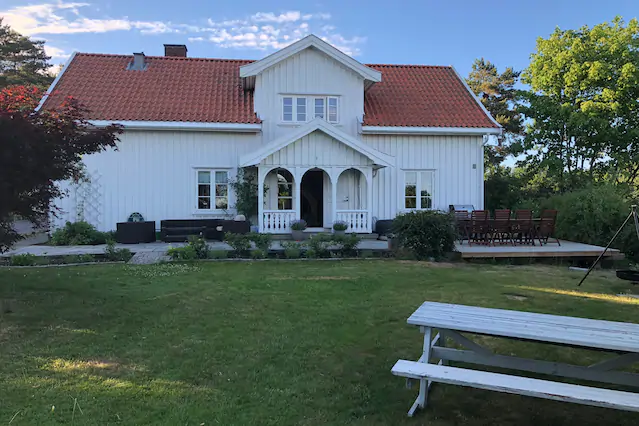 Following the success of early booking of accommodation for WOC in Latvia, accommodation for 2019 in Norway has now been booked close to Sarpsborg, the event centre. The dates are 10-18 August which brackets the WOC dates given above. Unfortunately, unlike Latvia, although it will depend on the final size of the NZL team, it is unlikely that there will be much (if any) room for supporters. Preparation of this having dragged on into the first few days of December, it is convenient to mention the Canterbury Champs which were held over 1/2 December in the high country. Saturday’s middle distance revisited the complex rock detail of Castle Hill and, by the results, presented the usual technical problems for many. Sunday was a long distance on Hogsback and clearly tested the physical limits of many. It is really good to see that Nick Hann, having spent most of 2019 injured, finally returned not only to competition, but to winning ways in both races. M21E: 1. Nick Hann (PP) 34:58, 2. Chris Forne (PP) 35:49, 3. Matt Scott (PP) 38:45. W21E: 1. Sara Prince (PP) 46:45, 2. Lara Scott (PP) 48:51, 3. Georgia Whitla (NL) 49:23. M21E: 1. Nick Hann 1:56:36, 2. Chris Forne 2:04:49, 3. Aaron Prince (PP) 2:08:50. W21E: 1. Sara Prince 1:40:46, 2. Lara Scott 1:43:49, 3. Lara Molloy (WN) 1:45:58. Support for the design and development of this website was provided by The Lion Foundation.